The Continental Congress, who was awaiting Maryland’s ratification for three years, decided not to wait another nine months to dissolve itself and enact the new constitution. On February 22, 1781 Congress set aside Thursday, March 1, 1781, "for completing the Confederation" and assigned a committee of three to consider a mode for announcing the same to the public.” On that date, the Articles of Confederation were adopted and the following day, March 2nd, 1781 the United States in Congress Assembled convened as the new government of the United States of America. What follows is a Chronology of the this Third United American Republic’s USCA Journals. March 1 Receives New York cession of western land claims; Maryland delegates sign and ratify Articles of Confederation; celebrates completion of the Confederation. 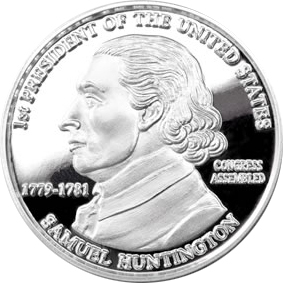 March 2 Convenes USCA for the first time with Samuel Huntington as President; Debates rules for congressional representation; appoints committee to revise the rules of Congress. March 3 Orders removal of Convention Army prisoners from Virginia. March 6 Orders preparation of a plan for "carrying into execution" all congressional acts and resolutions. March 7 Orders depreciation allowances for staff department officers. March 9 Commends troops for victory at the battle of Cowpens. March 10-14 Debates Continental finances. March 15 Receives Connecticut Act authorizing Congress to levy imposts for a limited time. March 16 Urges states to make Continental bills legal tender; appeals to states to meet fiscal quotas. March 19 Authorizes bills of exchange drawn on Benjamin Franklin in France. March 20 Adopts Fast Day proclamation; accepts Robert Morris's conditions for serving as superinten­dent of finance. March 22 Urges Connecticut to repeal time limitation from its approval of a Continental impost. March 24 Receives pledge of continued French military support with warning of impending end to financial aid. March 27 Adopts ordinance on the capture and condemnation of prizes. March 28 Receives Board of Admiralty report on the delay of supplies from France. March 30 Rejects Alexander McDougall's terms for accepting appointment as secretary of marine. March 31 Rejects motion to grant Robert Morris removal authority in the office of finance. April 2 Authorizes New York to raise two militia regiments at Continental expense. April 3 Orders recall of General Burgoyne from his parole and preparation of a manifesto condemning British treatment of Henry Laurens. April 4 Resolves against paying interest on bills of new emission. April 5 Adopts ordinance for establishing courts of admiralty. April 7 Adopts new instructions regulating privateers. April 8 Convenes in rare Sunday session to prepare against threatened invasion of Delmarva Peninsula. April 10 Orders limitation on bills of exchange drawn on ministers abroad. April 11 Orders establishment of magazines for provisioning French forces to defray a credit of $400,000 drawn for Benjamin Franklin in France. April 14 Commends John Paul Jones. April 16 Reaffirms prohibition against Continental officers holding civil appointments. April 18 Orders circulation to the states of a report on the public debt. April 21 Grants Robert Morris removal authority in the office of finance. April 23 Appoints committee to prepare impost ordinance. April 27 Orders immediate steps against drawing bills of exchange on John Jay and Henry Laurens abroad. May 1 Fails to convene quorum. May 3 Observes Fast Day. May 4 Adopts revised congressional rules. May 8 Receives report from "committee of the week," inaugurating new procedure for expediting congressional business; refers visiting Catawba Native American delegation to Board of War. May 14 Receives Robert Morris' acceptance as superintendent of finance; adopts “ways and means" measures for defraying costs "of the ensuing campaign." May 16 Authorizes John Jay to sell America (74-gun ship on the Portsmouth stocks) to Spain. May 18 Authorizes General Wayne to impress provi­sions. May 21 Receives Robert Morris proposal for establishing a bank. May 26 Approves plan "for establishing a national bank in these United States." May 28 Authorizes John Jay to recede from demand for free navigation of the Mississippi River; considers report on conference with La Luzerne on Austro-Russian mediation offer. May 31 Issues emergency call for troops for the southern department. June 1 Appeals to the states to meet quotas. June 4 Authorizes superintendent of finance to allocate French financial aid. June 7-9 Adopts revised negotiating instructions for minister plenipotentiary; rejects motion to appoint additional peace commissioners. June 11 Resolves to appoint two additional peace commissioners. June 13 Elects John Jay additional commissioner to negotiate peace; adopts letter of thanks to King of France. June 14 Authorizes exchange of John Burgoyne for Henry Laurens; resolves to appoint two additional peace commissioners; elects Benjamin Franklin, Henry Laurens and Thomas Jefferson to negotiate peace. June 15 Adopts instructions for minister plenipotentiary. June 16 Rejects motion for more severe corporal punish­ment for Continental troops. June 18 Adopts regulations for clothier general's depart­ment. June 19 Adopts instructions for Benjamin Franklin and rejects his request to resign. June 23 Directs Robert Morris to expedite launching of America. June 25 Rejects motion for appointing appeals judges "during good behaviour." June 26 Appoints John Paul Jones to command America; appoints Francis Dana Secretary to the Peace Commissioners. June 27 Appoints Robert Smith, Agent at Havana. July 2 Approves General Washington's request for 300 Pennsylvania riflemen. July 4 Observes Independence Day. July 6 Receives President Samuel Huntington's letter of resignation. July 9 Elects Samuel Johnston president of Congress. 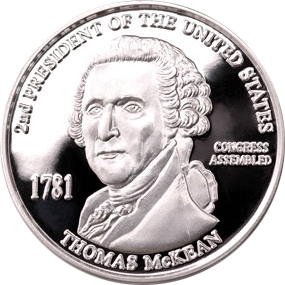 July 10 Elects Thomas McKean president of Congress upon Samuel Johnston's declining the office; instructs Thomas Barclay, vice-consul to France. July 11 Authorizes Robert Morris to negotiate loans in Spain and Portugal. July 12 Revokes John Adams' commission to negotiate commercial treaty with Britain. July 16 Reinstates General Lachlan McIntosh. July 20 Receives report on claims to the New Hampshire Grants. July 23 Endorses creation of a relief fund for South Carolina and Georgia refugees. July 25 Commends Gen. Nathanael Greene. July 26 Appoints committee to confer with General Washington on troop arrangements "for the ensuing year." July 27 Receives plan for a consular convention from the minister of France. July 31 Orders superintendent of finance and a member of the Board of War to headquarters to confer with General Washington; approves appropriation for the support of three Delaware Indian youths at the Princeton college. August 1 Orders preparation of a plan to reform the Post Office. August 3 Reads New York memorial on the New Hampshire Grants. August 7 Requests Connecticut to revoke commissions authorizing the seizure of property on Long Island; authorizes committee to confer with Vermont agents on their claim to independence. August 10 Elects Robert R. Livingston secretary for foreign affairs; rejects motion to cede the United States claim to navigation of the Mississippi. August 14 Authorizes the importation of salt. August 16 Adopts instructions to John Adams for negotiating a Dutch alliance. August 17 Instructs committee to confer with Vermont agents despite credentials dispute. August 20-21 Declares Vermont acceptance of prescribed boundaries as a condition to acceptance of Vermont independence. August 21 Enlarges General Washington's prisoner exchange authority. August 23 Exhorts states to maintain their representation in Congress. August 24 Directs superintendent of finance "to make provision for support of the civil list." August 29 Debates motion to retaliate against the execution of Col. Isaac Hayne; resolves to appoint an agent of marine to exercise the duties of a secretary of marine. August 31 Authorizes recognition of Philippe de L'Etombe as French consul to the New England states. September 3 Receives account of John Laurens' mission to France. September 4 Directs Washington to investigate British treatment of prisoners. September 5 Orders inquiry into Gen. Robert Howe's southern command. September 7 Recognizes Philippe Letombe's appointment as French consul to New England; appoints Robert Morris agent of marine. September 10 Recognizes Jean Holker's appointment as French consul to mid-Atlantic states; orders New Jersey and Pennsylvania militia call. September 11 Adopts new treasury ordinance. September 12 Places control of U.S. navy under the agent of marine. September 13 Sets day of thanksgiving. September 18 Orders retaliation for execution of Isaac Hayne; plans retaliation for enemy mistreatment of prisoners. September 19 Orders Delaware militia call; appoints treasury officers. September 20 Reorganizes hospital department. September 21 Receives French minister's report on mediation offers and peace overtures. September 24 Appoints William Irvine to Fort Pitt command. September 25 Receives memorial from Spanish agent Rendon; issues reassurance to northern Indians. October 1 Sets salaries for secretaries of war and marine. October 5 Appoints Thomas Barclay consul to France; discharges Delaware and Pennsylvania militia. October 11-12 Debates Yorktown campaign plans. October 16-17 Debates exercise of Continental jurisdiction over claims within Virginia's western lands. October 19 Reforms Post Office department. October 23 Accepts Thomas McKean's resignation as president (to remain until new Congress November 5). October 24 Receives news of Yorktown victory; observes "divine service (suitable to the occasion)" conducted by Chaplain George Duffield. October 26 Adopts thanksgiving proclamation; rejects Virginia motion to curtail committee investigation of land companies' western claims. October 29 Thanks American and French victors at York town; thanks Gen. Nathanael Greene and southern army. October 30 Appoints Gen. Benjamin Lincoln secretary at war; sets $8 million fiscal quota for 1782. November 1 Endorses General Greene's plans to treat with Cherokee and Chickasaw Indians. November 2 Apportions states' 1782 fiscal quotas; authorizes acceptance of quartermaster certificates in payment of quotas. 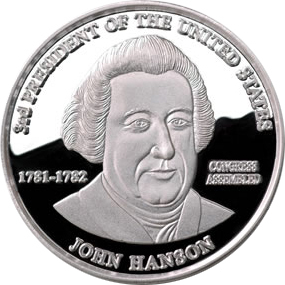 November 5 New Congress convenes; elects John Hanson president. November 8 Authorizes Board of War to prosecute spies under the articles of war. November 9 Restricts travel of Yorktown prisoners on parole. November 12 Repeals resolve accepting quartermaster certificates in payment of quotas. November 14 Urges states to maintain representation; sets date for hearing Connecticut-Pennsylvania boundary dispute. November 20 Augments authority of secretary of marine. November 23 Recommends that states legislate to punish violations of international law. November 28 Holds audience with General Washington. December 4 Adopts ordinance on "captures on water." December 5 Receives New York protest against congressional resolves on Vermont. December 10 Exhorts states to complete troop quotas. December 11 Calls states to take census "of the white inhabitants thereof." December 13 Observes day of thanksgiving. December 17 Appeals to the states for men and money. December 19 Orders placing supernumerary generals on half pay. December 20 Authorizes exchange of Gov. Thomas Burke. December 31 Adopts ordinance incorporating Bank of North America. 1782 -- January 2 Exhorts states to suppress trade with the enemy. January 3 Reforms medical department. January 8 Amends ordinance on captures on water; rejects motion to enlarge peace ultimata. January 9 Authorizes negotiation of consular convention with France. January 10 Reforms inspector general's department. January 17 Investigates suspicious Silas Deane letters on conciliating Britain. January 22 Instructs peace commissioners to communicate informal demands on fisheries and boundaries. January 25 Amends consular convention. January 28 Enlarges duties of Secretary Charles Thomson to relieve president of Congress. January 29 Advised of diminution of French aid. February 1 Instructs Benjamin Franklin on repayment of Dutch loan obtained for United States by France. February 8 Authorizes Franklin to borrow additional 12 million livres from France. February 11 Authorizes export of tobacco to New York by Yorktown "capitulants"; rejects appeal to permit states to clothe own Continental troops. February 18 Authorizes Washington to negotiate general prisoner exchange. February 20 Seeks authorization to apportion war expenses in contravention of Articles of Confederation quota formula. 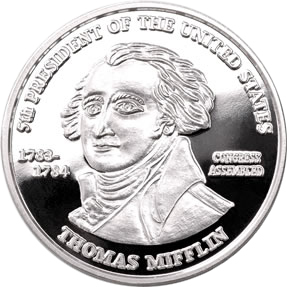 February 21 Authorizes establishment of a mint. February 22 Reorganizes department of foreign affairs. February 23 Authorizes exchange of Cornwallis for Henry Laurens. February 26 Amends ordinance on captures on water. February 27 Adopts plan for settlement of state accounts. March 1 Sets conditions for recognizing Vermont independence. March 7 Revises rules of Court of Appeals. March 11 Orders settlement of Bon Home Richard prize claims; refers Indian petition to New York. March 15 Drafts fiscal appeal to the states. March 19 adopts fast day proclamation. March 21 Holds audience with General Washington. March 27 Orders study of Continental Army staffing needs. March 30 Adopts measures for curtailing prisoner-of war escapes. April 1 Rejects fiscal quota reduction appeal. April 3-4 Debates Vermont compliance with independent statehood conditions. April 8 Revises paymaster regulations. April 9 Orders submission of comprehensive army returns. April 15 Rejects motion to elect a vice-president upon the disability of the president; elects Daniel Carroll "chairman" during the illness of President Hanson. April 18 Rejects motion to require delegates to disclose conflicts of interest on land claim issues. April 20 Debates Vermont compliance with independent statehood conditions. April 23 Recommends pensions for disabled troops; orders reduction of supernumerary officers. April 29 Endorses Washington's proposals for retaliation against the death of Joshua Huddy. April 30 Endorses John Jay's conduct of negotiations with the court of Madrid. May 1 Warns states of British plans to divide their enemies with proposals of separate peace; de bates western land cessions and motion to disclose delegates' conflicts of interest. May 4 Orders measures for the protection of American shipping. May 8 Opposes sending William Carmichael to the court of Portugal. May 13 Holds audience with French minister to celebrate birth of a dauphin. May 14 Denies emissary of Sir Guy Carleton passport to Philadelphia. May 21 Authorizes state authorities to curb trade with the enemy. May 22 Sends delegations to states to solicit compliance with requisitions. May 24 Reviews superintendent of finance report on status of U.S. credit abroad. May 27 Exhorts states to maintain representation in Congress; instructs Francis Dana to delay presenting his credentials to the court of Russia. May 28 Receives French report on peace overtures. May 31 Reaffirms opposition to separate peace negotiations. June 5 Orders study of proposal to enlist German prisoners of war. June 7 Rescinds work-release program for British prisoners of war. June 12 Revises regulations for naval courts-martial. June 14 Endorses proposals for return of South Carolina exiles. June 17 Calls for biannual inspection of the operation of the executive departments. June 20 Adopts great seal for the United States in Congress assembled. June 21 Exhorts states to curb trade with the enemy. June 24-27 Debates proposals for resolution of the Connecticut-Pennsylvania boundary dispute. June 27 Receives report from the congressional delegation to the southern states. June 28 Endorses General Greene's rejection of truce proposal in South Carolina. July 2 Endorses superintendent of finance recommendation against appointing consuls in the West Indies. July 3 Complains against Spanish release of British prisoners of war. July 10 Adopts ordinance regulating distribution of prizes. July 11 Places moratorium on promotion or appointment of Continental officers. July 17 Adopts ordinance to prevent illicit trade with the enemy. July 18 Receives report from the congressional delegation to the northern states; orders measures to stop mail robberies. July 23 Revises hospital department regulations. July 31 Debates recommendation for acceptance of western land cessions as a preliminary to restoring the public credit of the United States. August 1 Reorganizes adjutant general's department. August 5 Receives Robert Morris' funding plan. August 6 Revises John Jay's diplomatic instructions. August 7 Reorganizes Continental Army. August 9 Receives British commissioners' announcement that peace negotiations have begun at Paris. August 12 Authorizes Washington to negotiate prisoner exchange. August 14 Suspends inquiry into General Gates' conduct at Camden. August 15 Rejects move to repeal peace commissioners' instructions to be guided by French court. August 16-20 Debates Massachusetts' petition to include fisheries claim in peace ultimata. August 23 Appoints judges to hear Connecticut-Pennsylvania boundary dispute. August 27 Debates Kentucky statehood petition. August 29 Orders purchase of ship for packet service to Europe. September 3 Orders resumption of postal service to the Carolinas and Georgia; presents ship America to France. September 4 Sets fiscal quota for the immediate payment of interest on the public debt. September 6 Debates proposal to appeal to the states to cede western lands. September 9 Suspends issuance of bills of exchange to pay loan office certificate interest; instructs Washington on prisoner cartel. September 10 Sets state fiscal quotas. September 12 Endorses Robert Aitken's proposal to print an American edition of the Bible. September 14 Authorizes solicitation of $4 million in foreign loans. September 16 Commissions Washington to negotiate prisoner exchange. September 17 Refuses to accept Henry Laurens' resignation as peace commissioner. September 19-20 Debates report that Henry Laurens improperly petitioned parliament while imprisoned. September 24 Receives information from the chevalier de La Luzerne on recent peace maneuvers in Europe. September 28 Adopts plan of a treaty of amity and commerce with Sweden. October 1 Rejects New Jersey plan to retain Continental revenues for the payment of the state's Continental troops. October 3 Reassures France on U.S. commitment to military preparedness and to its no separate peace pledge. October 10 Appeals to Rhode Island and Georgia to adopt impost amendment. October 11 Sets day of thanksgiving and prayer October 14-15 Debates promotion of general officers. October 16 Sets fiscal quota for 1783; instructs Washington on prisoner exchange negotiations. October 18 Requests Washington to decide fate of Wyoming garrison; sets state fiscal quotas; adopts Post Office ordinance. October 23 Reorganizes quartermaster department. October 28 Adopts supplemental Post Office ordinance; recommends suspension of plans to execute Charles Asgill in retaliation for the death of Joshua Huddy. October 29 Accepts New York's western land cession. November 1 Refers investigation of Alexander Gillon to the superintendent of finance. November 2 Committee on Indian affairs confers with Catawba Indian delegation. 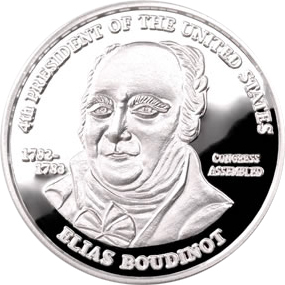 November 4 Convenes new Congress; elects Elias Boudinot president. November 7 Orders Washington to free Charles Asgill. November 8 Requests British officials to continue investigation of the death of Joshua Huddy. November 12 Renews appointment of Thomas Jefferson as peace commissioner. November 14 Debates report on Vermont's seizure of New York citizens. November 18 Appoints Thomas Barclay commissioner to settle the accounts of Continental officials abroad. November 19 Adopts new rules for carrying out the reorganization of the Continental Army. November 20 Debates Pennsylvania petitions on providing for the state's public creditors. November 21 Debates salaries of officials abroad. November 25-26 Debates propriety of exchanging Henry Laurens for Earl Cornwallis. November 27 Orders seizure of two Vermonters reported to be in correspondence with the enemy. December 3 Accepts resignation of secretary for foreign affairs. December 4 Grants John Paul Jones' request to serve with French navy. December 5 Censures Vermont officials; appoints appeals court judges. December 6 Directs superintendent of finance to exhort states to comply with fiscal quotas; appoints deputation to go to Rhode Island to secure ratification of impost amendment. December 11 Authorizes hiring out of prisoners of war. December 12 Receives Rhode Island explanation of rejection of impost amendment. December 13 David Howell acknowledges authorship of published letter violating congressional secrecy rules. December 16 Adopts response to Rhode Island's rejection of impost amendment. December 17 Reaffirms determination to send deputation to Rhode Island. December 21 Postpones resignation of secretary for foreign affairs; grants secretary leave of absence. December 24 Amends Post Office ordinance to extend franking privilege. December 25-26 Observes Christmas. December 31 Instructs peace commissioners to seek commercial reciprocity with Britain. 1783 - January 1 & 2 Thanks France for military aid and naval protection. January 3 Records Trenton trial decree in Connecticut Pennsylvania boundary dispute (first settlement of interstate dispute under Articles of Confederation) January 6 Receives army petition on pay arrears; appoints committees to inquire into the management of the executive departments. January 7 Debates setting exchange rate for redeeming old Continental emissions. January 10 Learns that superintendent of finance has over drawn bills of exchange on "the known funds procured in Europe"; army deputation meets with grand committee on Continental Army grievances. January 13 Debates expediency of negotiating additional foreign loans. January 14 Acquiesces in Rhode Island delegates' request to share intelligence from abroad with state's officials; debates land valuation formula in grand committee. January 17 Thanks General Greene and the southern army; declares inexpediency of seeking additional foreign loans. January 21 Receives U.S.-Dutch treaty negotiated by John Adams. January 22 Ratifies Franco-American contract negotiated by Benjamin Franklin. January 23 Ratifies Dutch treaty. January 24 Orders investigation of abuses of flag of truce by the Amazon; rejects report recommending establishment of a library for Congress. January 25 Directs the superintendent of finance to pay the Continental Army. January 27-31 Debates proposals for funding the public debt. January 30 Rejects Pennsylvania proposal to pay interest due on Continental securities owned by its own citizens. February 4 Receives Vermont remonstrance against threatened Continental intervention. February 4-8 Debates proposals for funding the public debt and setting state quotas.February 10-14 Debates proposals for funding the public debt and setting state quotas. February 17 Adopts plan to appoint commissioners for estimating land values and setting state quotas. February 18 Orders superintendent of finance to estimate the public debt, and each executive department to report a comprehensive civil list. February 21 Exhorts states to maintain their representation in Congress. February 25-28 Debates proposals for commutation of Continental officers' half pay. March 4 Amends ordinance "for establishing courts for the trial of piracies." March 6-7 Receives report on funding the public debt. March 10 Debates commutation of Continental officers' half pay. March 11 Debates revenue proposals. March 12 Receives the preliminary treaty of peace. March 12-15 Reads treaty and foreign despatches. March 17 Receives Washington's report on the army crisis at Newburgh. March 18 Debates report on the public credit. March 19 Debates proposal to censure ministers for ignoring negotiating instructions. March 20-21 Debates report on the public credit. March 22 Adopts resolve to commute Continental officers' half pay for life to full pay for five years. March 24 Recalls all Continental ships on cruise. March 27-28 Debates report on the public credit. March 29 Rejects proposal for increasing congressional oversight of the office of finance. March 31 Renews committee for overseeing the office of finance. April 1 Recommends that states revise formula for setting Continental quotas; learns of call for an economic convention at Hartford; receives invitation to locate Continental capital in Kingston, N.Y. April 4 Orders suspension of enlistments in Continental Army; debates report on the public credit. April 7 Revises Continental quotas. April 11 Adopts cease-fire proclamation. April 15 Ratifies preliminary treaty of peace. April 17 Orders sale of Continental horses. April 18 Asks states for authority to levy revenue duties. April 23 Authorizes Washington to discharge Continental troops. April 24 Directs Washington to confer with Gen. Guy Carleton on the evacuation of New York. April 26 Adopts Address to the States on new revenue plan. April 28 Requests Robert Morris to continue as superintendent of finance until the reduction of the Continental Army. April 30 Rejects motion to hold debates in public. May 1 Directs secretary at war to negotiate cease-fire with hostile Indian nations; authorizes American ministers to negotiate treaty of commerce with Great Britain. May 2 Appeals to states for collection of taxes for payment of discharged troops; recommends that states adopt copyright laws for protection of authors. May 9 Asks states to convene assemblies to adopt fiscal recommendations. May 15 Revises rules to appoint committees by secret ballot. May 19-20 Debates treaty article on restitution of confiscated loyalist property. May 22 Instructs Francis Dana on negotiating treaty with Russia. May 26 Instructs American ministers on peace terms concerning evacuation of American posts and carrying off of American slaves; instructs Washington on furloughing Continental troops. May 29-30 Debates treaty articles on British debts and loyalist property. June 2 Appoints Oliver Pollock commercial agent to Cuba. June 4 Debates Virginia cession of western land claims; refers offers to locate the Continental capital at Kingston, N.Y., or Annapolis, Md., to the states (to be debated October 6). June 10 Receives report of the mutiny of a troop of Virginia dragoons. June 11 Directs furlough of Delaware, Maryland, Pennsylvania, and Virginia troops. June 12 Instructs American ministers on avoiding treaties of armed neutrality. June 13 Receives "mutinous memorial" from Continental Army sergeants. June 17 Commends the conduct of business in the office of finance. June 19 Receives notice of the mutiny of Continental troops at Carlisle; appoints committee to confer with Pennsylvania officials on the mutiny. June 20 Debates Virginia cession of western land claims. June 21 Confronts mutineers of the Pennsylvania Line; authorizes president to reconvene Congress at Trenton or Princeton, NJ. June 21 President Boudinot issues proclamation reconvening Congress at Princeton. June 30 Reconvenes at Princeton, NJ. July 1 Directs Gen. Robert Howe to suppress mutiny; adopts report explaining congressional response to the mutiny. July 2 Thanks New Jersey officials for their reception of Congress. July 9-11 Debates proposals for paying arrears due Continental troops. July 16 Orders recall of commissioners investigating British embarkations from New York; directs Secretary Thomson to maintain record of unrepresented states. July 23 Receives Philadelphia address inviting Congress' return. July 28 Returns noncommittal response to Philadelphia address; directs General Washington to attend Congress; relieves General Howe's detachment ordered to suppress Pennsylvania mutiny. July 29 Ratifies treaty of amity and commerce with Sweden. July 30 Directs superintendent of finance to publish regulations for receiving "Morris notes" in payment of taxes. August 1 Rejects motion to adjourn to Philadelphia. August 6 Authorizes distribution of "necessities" to Delaware Indians and friendly "northern nations." August 7 Orders preparation of "an equestrian statue of the Commander in Chief." August 9 Authorizes furloughing additional Continental troops and continuation of subsistence for Hazen's Canadian regiment. August 13-14 Debates motion for returning to Philadelphia. August 15 Receives proceedings of the court-martial of the Philadelphia mutineers. August 18 Directs superintendent of finance to report estimate of the Continental debt. August 26 Conducts audience with General Washington. August 28 Debates ordinance for prohibiting settlement of Indian lands. September 1 Receives Pennsylvania Assembly resolves for re turning to Philadelphia. September 10 Orders renewal of committees to oversee the executive departments. September 13 Adopts stipulations concerning the cession of Virginia's western land claims; confirms acquittal of leaders of the Philadelphia mutiny.September 16-19 Debates Massachusetts' call for retrenchment of Continental expenses. September 22 Adopts proclamation regulating the purchase of Indian lands. September 24 Adopts secret order authorizing Washington to discharge Continental troops "as he shall deem proper and expedient." September 25 Reaffirms commitment to commutation of half pay claims; proclaims treaty with Sweden; debates report on federal jurisdiction over site of congressional residence. September 29 Lifts injunction of secrecy on most foreign dispatches. September 30 Promotes Continental officers not promoted since 1777. October 1 Debates instructions for ministers abroad. October 3 Debates Indian affairs. October 6-9 Debates location of the Continental capital. October 8 Receives Quaker petition for suppression of the slave trade. October 10 Resolves to leave Princeton; debates location of the capital. October 15 Adopts resolves regulating Indian affairs. October 17 Debates location of the capital. October 18 Adopts Thanksgiving proclamation. October 21 Adopts two capital locations-Congress to meet alternately "on the banks of the Delaware and Potomac." October 22 Orders distribution of the peace treaty to the states. October 23-24 Debates peacetime military arrangements. October 27-28 Fails to convene quorum. October 29 Adopts instructions for negotiating commercial treaties. October 30 Authorizes Pennsylvania to negotiate Indian lands purchase. October 31 Ratifies fiscal contract with France; holds audience with Dutch minister van Berckel. November 1 Orders Post Office theft inquiry; adopts rules to improve congressional attendance. November 3 Convenes new Congress; elects Thomas Mifflin president (elects Daniel Carroll chairman in the president's absence). November 4 Authorizes discharge of the Continental Army-"except 500 men, with proper officers. "Adjourns to Annapolis, to reconvene the 26th. December 13 Reconvenes at Annapolis. December 15 Fails to convene quorum. December 16 Reads foreign dispatches. December 17 Fails to convene quorum. December 22 Holds public entertainment for General Washington. December 23 Appeals to unrepresented states to maintain congressional attendance; receives Washington and accepts his resignationas Commander-in-Chief. December 27 Receives report on capital location. December 29 January 1 Fails to convene quorum. 1784 - January 3 Resolves to receive Francis Dana, "relative to his mission to the Court of Russia." January 5 Rejects proposal to nominate knights to the Polish Order of Divine Providence. January 8 Debates Quaker petition for suppression of the slave trade. January 10 Fails to convene quorum. January 14 Ratifies definitive treaty of peace, "nine states being present"; recommends that the states "provide for the restitution of" confiscated loyalist property. January 15 Acquiesces in public creditor demand that loan office certificate interest not be subject to depreciation. January 17-20 Fails to convene quorum. January 21 Rejects motion denying Continental jurisdiction in Lusannah admiralty appeal. January 22 Halts plan to dispose of military stores. January 23 Sets date for selecting judges to determine "the private right of soil" in the Wyoming Valley. January 26 Narrows half-pay eligibility rules. January 27-28 Fails to convene quorum. January 30 Grants sea-letters for The Empress of China voyage to Canton. February 3 Creates post of undersecretary to revive office for foreign affairs. February 4-5 Fails to convene quorum. February 6 Issues brevet promotions for departing foreign officers. February 7-9 Fails to convene quorum. February 10 Plans general treaty with Indian nations of the northern department. February 11 Registers commissions of five French consuls and five vice-consuls. February 12 Fails to convene quorum. February 16-23 Fails to convene quorum. February 24 Postpones debate on garrisoning frontier posts for failure of nine-state representation. February 27 Commends marquis de la Rouerie; deadlocks over appointment of a secretary for foreign affairs. March 1 Receives Indiana Company petition; accepts Virginia cession of western land claims; reads western land ordinance report. March 2 Elects Henry Remsen undersecretary for foreign affairs; deadlocks over appointment of a secretary. March 4 Elects commissioners to negotiate with the Indians. March 5 Debates plans for holding treaty with the Indians. March 10 Fails to convene quorum. March 12 Rejects Connecticut protest against half-pay plan. March 13 Rejects Delaware delegate credentials, exceed ing three-year limitation. March 16 Bars appointment of aliens to consular and other foreign posts. March 19 Adopts instructions for Indian commissioners. March 22-25 Postpones debate on Lusannah admiralty appeal. March 23 Rejects credentials of Massachusetts delegate Samuel Osgood. March 26 Affirms that in negotiating commercial treaties these United States be considered . . . as one nation, upon the principles of the federal constitution." March 30 Sets quotas and adopts fiscal appeal to the states; rejects motion denying Continental jurisdiction in Lusannah appeal. April 1-2 Debates report on negotiating commercial treaties. April 5 Adopts appeal to the states on arrears of interest payments on the public debt. April 6 Reads report on maintaining frontier garrisons. April 8 Instructs agent of marine on sale of Continental ships. April 12 Debates public debt. April 14 Debates motion to adjourn from Annapolis to various proposed sites. April 16 Instructs "commissioners for treating with the Indian nations." April 19 Debates western land ordinance; deletes anti-slavery paragraph. April 20-21 Debates western land ordinance. April 23 Debates western land ordinance. April 24 Receives New York memorial concerning the Vermont dispute. April 26 Resolves to adjourn June 3, to reconvene at Trenton October 30; debates capital's location. April 27-28 Debates public debt. April 28 Orders arrest of Henry Carbery, leader of Pennsylvania mutiny. April 29 Exhorts states to complete western land cessions. April 30 Requests states to vest Congress with power to regulate trade "for the term of fifteen years." May 3 Reaffirms secrecy rule on foreign dispatches; receives French announcement on opening free ports to U.S. trade. May 5 Debates retrenchment of the civil list. May 7 Sets diplomatic salaries; appoints John Jay secretary for foreign affairs. May 11 Adopts instructions for negotiation of commercial treaties. May 12 Resolves to request delivery of frontier posts to U.S. troops. May 15 Debates disqualification of Rhode Island delegates. May 17 Receives announcement of French minister La Luzerne's intention to return to France. May 18 Orders troops for the protection of Indian commissioners. May 19-24 Debates disqualification of Rhode Island delegates. May 21-22 Fails to convene quorum. May 25-27 Debates garrisoning frontier posts. May 28 Adopts "Ordinance for putting the department of finance into Commission"; reads proposed land ordinance and report on Indian affairs. May 29 Appoints Committee of the States "to sit in the recess of Congress," and adopts resolutions defining its powers and rules. Offers reward for arrest of chevalier de Longchamps for assault on the French consul general, the marquis de Barbe-Marbois. May 31 Debates garrisoning frontier posts. June 1 Resolves to meet thrice daily until adjournment. June 2 Orders discharge of Continental troops "except 25 privates to guard the stores at Fort Pitt, and 55 to guard the stores at West Point." June 3 Instructs ministers plenipotentiary not to relinquish navigation of the Mississippi; authorizes call of 700 militiamen to protect the northwestern frontiers; elects three treasury commissioners; adjourns "to meet at Trenton on the 30th day of October." June 4 Convenes Committee of the States. Committee reads powers (requiring quorum of nine states) and adjourns to June 26. June 26 Fails to convene quorum to July 5. July 5 Committee reconvenes, adopts rules, meets in 20 regular sessions to August 3. August 4-19 Fails to convene quorum, except briefly on August 9, and dissolves amid controversy. November 1 Convenes at Trenton, two states represented new congress fails to achieve quorum to convene as prescribed by the Articles of Confederation November 29 Achieves quorum, seven states represented. November 30 Elects Richard Henry Lee president. December 3 Registers commission of Swedish consul Charles Hellstedt; orders redeployment of Fort Stanwix troops to West Point. December 7 Countermands redeployment of Fort Stanwix troops, who are ordered to Fort Rensselaer. December 8 Receives Massachusetts and New York agents assembled to select judges for hearing land claim dispute between the two states. December 11 Rejects motion to adjourn from Trenton; com mends the marquis de Lafayette. December 14 Postpones election of treasury commissioners; directs Benjamin Franklin to delay signing consular convention with France. December 15 Receives Spanish announcement closing Mississippi River. December 17 Elects chaplain to Congress; resolves to appoint minister to Spain. December 20 Overturns decision to create two capitals; appropriates $100,000 for capital buildings. December 23 Adopts ordinance for fixing upon a place for the residence of Congress." December 24 Certifies selection of judges for hearing Massachusetts-New York land claim dispute; adjourns to New York City. 1785 -- January 11 Reconvenes, five states represented. January 13 Achieves quorum, seven states represented. January 18 Accepts offer of New York City Hall for the use of Congress. January 20 Communicates to states intelligence on the precariousness of United States credit abroad. January 24 Orders preparation of a requisition on the states for 1785. January 25 Elects treasury commissioners; tables L'Enfant plan for establishing a corps of engineers. January 27 Adopts ordinance "for ascertaining the powers and duties of the Secretary at War." January 31 Resolves to appoint minister to Great Britain. February 1 Ratifies terms of a two-million-guilder Dutch loan. February 2 Adopts proclamation urging states to penalize counterfeiting. February 7 Approves lease of public buildings at Carlisle, Pa., to Dickinson College; orders removal of War Office, Post Office, and Treasury offices to New York. February 10 Elects Philip Schuyler commissioner for planning federal capital. February 11 Adopts regulations for the office for foreign affairs, conceding to Secretary Jay's demands. February 18 Limits terms of ministers abroad. February 21 Resolves to send commissioners to the Illinois Settlements. February 24 Appoints John Adams minister to Great Britain. March 4 Opens debate on western land ordinance. March 7 Authorizes Benjamin Franklin's return to America; resolves to appoint minister to the Netherlands. March 8 Elects Henry Knox secretary at war. 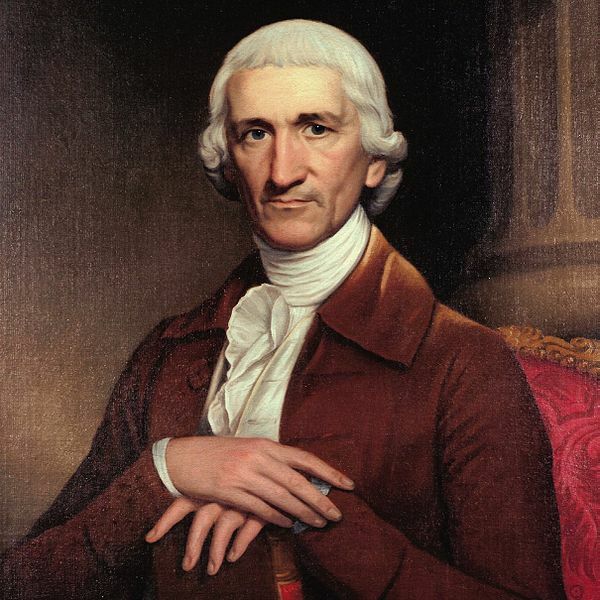 March 10 Elects Thomas Jefferson minister to France. March 11 Adopts instructions for negotiating with the Barbary States. March 15 Adopts instructions for the southern Indian commissioners. March 16 Rejects motion to limit slavery in the territories. March 17 Imposes 12-month limit for submission of claims against the United States. March 18 Adopts instructions for the western Indian commissioners. March 21 Elects southern Indian commissioners; thanks king of Denmark for offer to ordain American candidates for holy orders. March 28 Receives report on granting Congress commerce powers. March 31 Adopts ordinance for regulating the office of secretary of Congress; receives report on 1785 requisition. April 1 Debates Continental military needs. April 7 Authorizes military establishment of 700 troops. April 14 Reads revised western land ordinance. April 18 Accepts Massachusetts western land cession. April 22-28 Debates western land ordinance. April 29 Appeals to states to maintain representation. May 2-6 Debates western land ordinance. May 9-10 Fails to achieve quorum (five states). May 12 Fails to achieve quorum (six states). May 13 Receives coinage report. May 18-19 Debates western land ordinance. May 20 Adopts western land ordinance; appeals to North Carolina to repeat western land cession. May 24 Fails to achieve quorum (four states). May 27 Renews appointment of geographer of the United States; appoints 13 continental surveyors. June 1 Authorizes appointment of federal court to decide South Carolina Georgia boundary dispute. June 3 Publishes treaties with the Indians negotiated at Fort Stanwix and Fort McIntosh. June 6 Authorizes negotiation of an Indian treaty at Vincennes. June 7 Discharges Fort Pitt garrison. June 14 Responds to French announcement of the birth of a second heir to the throne. June 17 Orders John Jay to plan audience for the Spanish plenipotentiary Diego de Gardoqui. June 20 Orders inquiry into the administration of the late superintendent of finance. June 21 Orders annual inquiry into treasury administration. June 23 Appoints William Livingston minister to the Netherlands (declines). June 29 Asks Virginia to provide military support for Indian commissioners. June 30 Orders a study of mail transportation. July 1 Rejects motion to abolish court of appeals, but terminates salaries of the judges. July 2 Receives Diego de Cardoqui. July 4 Celebrates Independence Day. July 5 Appoints John Rutledge minister to the Netherlands (declines). July 6 Adopts the dollar as the money unit of the United States. July 11 Continues rations for Canadian refugees. July 12 Receives Post Office report. July 13-14 Debates granting Congress commerce power. July 18 Debates 1785 requisition. July 20 Abolishes commissary of military stores. July 22 Debates 1785 requisition. July 25 Abolishes quartermaster department. July 28-29 Debates 1785 requisition. August 1-3 Debates 1785 requisition. August 5 Orders removal of the treasurer's office to New York (by October 1) . August 10-13 Recesses. August 15 Thanks king of Spain for sending Gardoqui mission. August 17 Appoints Samuel Holten chairman in the absence of President Lee (through September 29) for the recovery of his health; Secretary Thomson to report delegate attendance monthly. August 18 Endorses conduct of Massachusetts governor James Bowdoin in controversy with British naval captain Henry Stanhope. August 25 Grants John Jay greater latitude in negotiating with Gardoqui. August 29 Abolishes committee of the week (duties transferred to secretary of Congress. September 2-3 Fails to achieve quorum (five states and two states). September 5 Receives John Jay report on British occupation of northwest posts. September 7 Authorizes John Jay to inspect the mails whenever required by United States "safety or interest"; approves the conveyance of mails by stage carriages. September 13-17 Debates 1785 requisition. September 19-21 Debates appeal of Connecticut settlers in the Wyoming valley. September 22-26 Debates 1785 requisition. September 27 Adopts 1785 requisition. September 29 Authorizes commission to settle Massachusetts New York eastern boundary. October 5 Orders postmaster general to extend system of posts. October 7 Debates threat of western separatism. October 12 Authorizes troops to attend western Indian negotiations; exhorts states to meet fiscal quotas. October 17-18 Mourns death of Virginia delegate Samuel Hardy (age 27). October 20 Receives John Jay report on naval threat of Barbary states. October 21-22 Fails to achieve quorum (six states and one state) . October 25 Fails to achieve quorum (four states). October 27 Rejects proposal to create consular establishment. October 28 Confers consular powers on ministers abroad. November 2 Postpones convening of court to determine Massachusetts-New York western land claims dispute; suspends recruitment for 700 troop establishment. November 4 Congressional session expires. November 7 Convenes at New York City, three states represented new congress fails to achieve quorum to convene as prescribed by the Articles of Confederation. 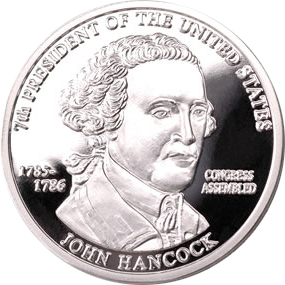 November 23 Achieves quorum, seven states represented; elects John Hancock president (in absentia), David Ramsay chairman. November 24 Elects two congressional chaplains. November 25 Receives report on British consul John Temple. November 28-29 Fails to achieve quorum. December 2 Recognizes John Temple as British consul. December 5-26 Fails to achieve quorum December 27 Receives secretary at war reports. 1786 - January 2 Receives British complaint on treatment of loyalists. January 4 Receives reports on states' response to appeals to grant Congress authority to raise revenue and regulate trade. January 5 Receives report on Algerian capture of American seamen. January 12 Receives report on settlement of Continental accounts. January 18 Refers Connecticut cession to committee. January 19 Orders report on 1786 fiscal estimates. January 27 Elects Samuel Shaw consul to Canton, China. January 30 Appeals to six unrepresented states to send delegates. February 1 Removes injunction of secrecy on correspondence concerning "the appointment of Commissioners to treat with the Barbary powers." February 3 Debates states' response to congressional fiscal appeals. February 8 Receives report on French loan interest requirements. February 9 Justifies abolishing salaries of court of appeals judges. February 16-24 Fails to achieve quorum. February 25 Receives reports on Franco-American postal plan and on 1786 fiscal estimates. March 3 Repeats call to the states for authority to regulate trade. March 7 Appoints committee to confer with New Jersey Assembly on its refusal to comply with 1786 Continental requisition. March 10 Rejects New York appeal for an extension of time for receiving Continental claims from citizens of the state. March 14 Clarifies form of oaths required for Continental officeholders. March 17-18 Fails to achieve quorum. March 21 Receives report on capital punishment in military courts martial. March 22 Receives report of New Jersey's reversal of opposition to 1786 Continental requisition. March 24 Appoints single commissioner to consolidate settlement of accounts of the five great departments (clothier, commissary, hospital, marine, and quartermaster). March 27 Orders arrest of Maj. John Wyllws for execution of army deserters. March 29 Directs secretary for foreign affairs to report on negotiations for British evacuation of frontier posts. April 5 Receives report on "negotiations, and other measures to be taken with the Barbary powers." April 10 Receives report on Connecticut land cession. April 12 Receives board of treasury report on coinage. April 19 Rejects Massachusetts request for Continental ordnance April 27 Receives translations of French decree on fisheries bounties. May 2 Holds audience with Cornplanter and other Seneca chiefs. May 5 Holds audiene with Cornplanter and other Seneca chiefs. May 6 Fails to achieve quorum. May 8 Appoints second commissioner for settlement of accounts of the five great departments. May 9 Directs Continental Geographer to proceed with survey of western territory. May 11 Debates Connecticut cession. May 12 Declares navigable waters in the territories forever free to their inhabitants and to the citizens of the United States. 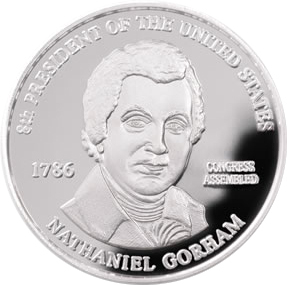 May 15 Elects Nathaniel Gorham chairman of Congress to succeed David Ransay. May 17 Ratifies Prussian-American treaty of commerce. May 18 Postpones to September meeting of agents for Georgia-South Carolina boundary dispute. May 22-25 Debates Connecticut cession. May 26 Declares conditional acceptance of Connecticut cession. May 29 Fails to achieve quorum. May 31 Amends rules to war; receives John Jay request for a committee to confer with him on negotiations with Diego de Gardoqui. June 5 Receives resignation of President John Hancock; receives report on military establishment. June 6 Elects Chairman Nathaniel Gorham president. June 13-14 Fails to achieve quorum. June 15 Receives reports on prospects for Indian hostilities and on Continental arsenals and magazines. June 16 Orders Indian commissioners to report on prospects for hostilities June 19-20 Fails to achieve quorum. June 21 Bans acceptance of paper money by post offices. June 22 Orders troop reinforcements "to the rapids of the Ohio." June 27 Directs court of appeals judges to reconvene November 6 and reinstates salaries on per diem basis. June 28 Receives draft ordinance for the Indian department. June 30 Responds to Virginia appeal for protection against western Indians. August 1 Receives report on arsenals and ordnance. August 2 Adopts 1786 requisition. August 3 Authorizes purchase of West Point; confers with secretary for foreign affairs on negotiation of treaty with Spain. August 7 Adopts Indian affairs ordinance. 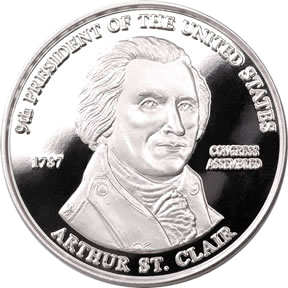 August 8 Adopts coinage standards; orders board of treasury to report an ordinance for establishment of a mint. August 9 Appeals to North Carolina, South Carolina, and Georgia for land cessions. August 10 Debates John Jay's instructions for negotiating Spanish treaty. August 14 Appoints committee to meet with Pennsylvania Assembly on revising act authorizing Continental impost. August 16-23 Debates John Jay's instructions for negotiating Spanish treaty. August 24 Orders relief for displaced Moravian Indians. August 28 Debates John Jay's negotiating instructions. August 29 Repeals John Jays'negotiating instructions by seven-to-five vote (which was contested on the ground that nine votes were constitutionally required). August 30-31 Debates repeal of John Jay's instructions. September 1-2 Debates repeal of John Jay's instructions. September 4 Convenes agents for appointing a court to hear South Carolina-Georgia boundary dispute. September 5 Authorizes settlement of Pennsylvania fiscal claim. September 11 Receives South Carolina appeal for congressional intervention in hearing boundary dispute with Georgia. September 12 Receives John Jay report on consular convention with France. September 13 Selects judges for hearing South Carolina_Georgia boundary dispute. September 14 Accepts Connecticut land cession. September 18 Bars payment of Continental requisitions in paper money. September 20 Receives report on Annapolis Convention; orders postmasters "to receive no other money in payment for postage than specie." September 25 Receives report on conference of congressional committee with Pennsylvania Assembly. September 28 Debates repeal of John Jay's negotiating instructions. September 29 Debates ordinance for territorial government. October 3 Instructs Thomas Jefferson on renegotiation of consular convention with France. October 4 Debates Northwest ordinance. October 6 Elects James White southernb Indian superintendent. October 10 Directs Indian superintendent to confer with southern states. October 13 Adopts ordinance for settlement of the states' Continental accounts; receives report on British response to request for evacuation of frontier posts. October 16 Adopts ordinance for establishmentj of a mint. October 18 Receives secretary at war's report on Shays' rebellion. October 21 Increases military establishment - ostensibly for Indian defense but with an eye to the "disorders" in Massachusetts. October 23 Appeals to states for authority to regulate trade; authorizes secretary for foreign affairs to inspect the mails for reasons of national security (excepting the mail of members of Congress). October 26 Orders inquiry into postal service. October 30 Authorizes suspension of interest credits on Rhode Island-held debt in retaliation for state paper money policy. November 1-2 Debates postal reform. November 3 Adjourns - referring "the several matters now before Congress" to the new Congress scheduled to meet "on Monday next"
February 2 Achieves quorum; elects Arthur St. Clair president, Samuel Provost and John Rodgers chaplains. 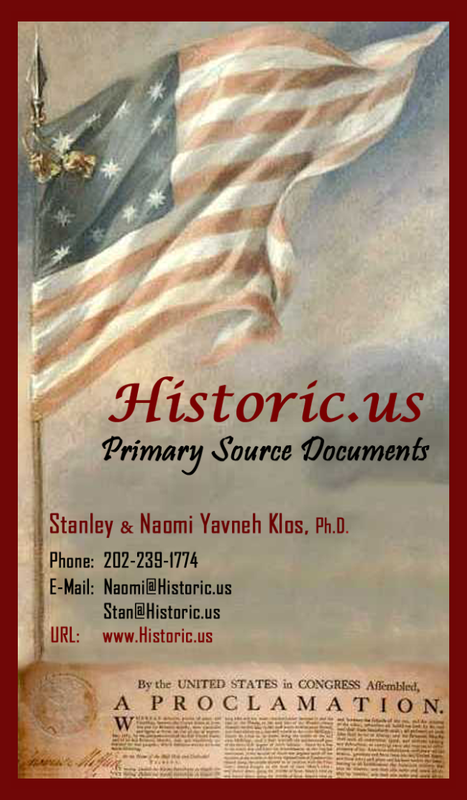 February 3 Reads correspondence received since early November February 5 Orders report on 1787 fiscal estimates. February 6-9 Fails to achieve a quorum. February 12 Adopts report of committee on qualifications; reads accumulated treasury and war office reports. February 14 Nine states represented for first time; reads draft Post Office ordinance. February 15 Authorizes postmaster general to contract for mail delivery. February 19 Elects Lambert Cadwalader chairman in absence of President St. Clair. February 21 Receives report on Annapolis Convention; resolves to call for a Philadelphia convention to "render the federal Constitution adequate to the exegencies of Government and the preservation of the Union." February 22-23 Fails to achieve a quorum February 26 Receives Virginia call for an interstate commercial convention. March 5-7 Fails to achieve quorum March 8 Reaffirms specie requirement for quota payments. March 9 Receives Massachusetts report on Shays' Rebellion; adopts report on western posts. March 13 Receives report on military stores; authorizes appointment of unsalaried commercial agent at Lisbon. March 23 Adopts reduction of the Continental civil list. March 28 Debates motions on the loan or sale of Continental property. March 30 Receives report of seizure of American property at Natchez. April 2 Receives 1787 fiscal estimates. April 4 Orders John Jay to report on Spanish negotiations: receives report on the military establishment. April 5 Receives report on land sales plan. 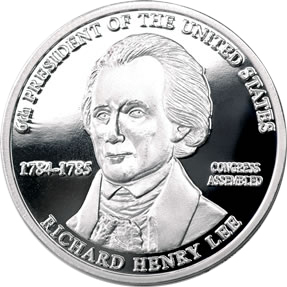 April 9 Orders discharge of troops enlisted against Shays' Rebellion except two artillery companies; receives treasury report on copper coinage. April 10 Debates location of federal capital. April 13 Adopts letter to the states recommending repeal of all state acts repugnant to the treaty of peace; receives John Jay reports on Spanish negotiations. April 16-17 Fails to achieve quorum (three and six states attending). April 18 Receives draft ordinance on settlement of state accounts; debates sending commissioner to Spain to negotiate Mississippi question. April 20 Receives John Jay report on sending commissioner to Spain; receives committee report on copper coinage. April 21 Adopts copper coinage plan; adopts western land sales plan. April 23 Extends franking privilege to Philadelphia Convention delegates. April 24 Orders recapture of Fort Vinncennes; receives notification of the settlement of the Massachusetts-New York land dispute April 25 Receives North Carolina protest against federal Indian treaties; receives report on western land ordinance. April 27 Fails to achieve quorum. May 1 Fails to achieve quorum May 2 Authorizes sale of surplus Continental arms. May 3 Receives British consul Phinease Bond; receives report on the military establishment. May 7 Appoints commissioners for settling departmental accounts; adopts ordinance for settlement of state accounts. May 8 Debates proposal concerning interstate commercial conventions. May 9 Debates Northwest Ordinance. May 10 Debates Northwest Ordinance; debates location of federal capital. May 11 Debates Mississippi negotiations with Spain. May 12-31 Fails to achieve quorum. July 2-3 Fails to achieve quorum. July 4 Achieves quorum; elects William Grayson chairman in absence of President St. Clair; receives report on Spanish negotiations. July 5 Fails to achieve quorum. July 10 Receives report on sale of western lands to land companies. July 11 Reads Northwest Ordinance; receives report on issuance of indents for Continental quotas; receives report on Indian hostilities. July 13 Adopts Northwest Ordinance. July 14 Orders report on 1787 requisition. July 18 Ratifies commercial treaty with Morrocco; receives report on southern Indian land claims. July 19-21 Debates measures for Indian pacification July 20 Instructs John Adams on a convention with Britain on violations of the treaty of peace. July 23 Approves appointments of commercial agents to Morocco. July 25 Debates measures for pacification of western Indians. July 26 Debates measures for pacification of southern Indians; authorizes postal contracts; receives report on foreign loans. July 27 Orders report on formation of "a Confederacy with the powers of Europe" against the Barbary States; instructs Jefferson on consular convention with France. August 3 Debates southern Indian affairs. August 6-8 Fails to achieve quorum. August 9 Accepts South Carolina land cession; receives report on northern Indian affairs. August 10-31 Fails to achieve quorum. September 3-19 Fails to achieve quorum September 20 Receives report of the Philadelphia Constitutional Convention. September 21 Reelects treasury commissioners Arthur Lee, Walter Livingston, and Samuel Osgood; reduces civil list. September 24 Accepts John Adams' retirement (post February 24, 1788); receives report on Netherlands protest. September 26-27 Debates Constitution submitted by Philadelphia Convention.. September 28 Resolves to submit Constitution to the states. September 29 Receives report on prize money received by John Paul Jones; receives report on 1787 requisition. November 1-2 Fails to achieve quorum. February 1 Reviews backlog of reports and letters. February 5 Receives report on Massachusetts-New York boundary survey. February 6-9 Fails to achieve quorum. February 12 Authorizxes secretary for foreign affairs to isue sea letters. February 14 Sets date for reception of new Frence minister, comte de Moustier. February 19 Elects John Cleves Symmes judge of the Northwest territory. February 25 Debates appointment jof superintendent of Indian affairs for the southern department. February 26 Holds audience for comte de Moustier. February 28 Receives treasury report on foreign debt. February 29 Appoints Samuel Provost and John Rodgers chaplains of Congress, and Richard Winn superintendent of Indian affairs for the southern department; debates Kentucky statehood motion. March 4 Debates Kentucky statehood in committee of the whole. March 6 Receives reports on the claims of French settlers in the Illinois country and on the survey of western lands. March 10--;11 Fails to achieve quorum. March 12 Receives report on military bounty lands. March 18 Receives communications on Indian affairs. March 19 Debates western land ordinance amendment. March 24--;27 Debates western land ordinance amendment. March 31 Fails to achieve quorum. April 1--;30 Fails to achieve quorum. May 1 Fails to achieve quorum. May 2 Receives treasury report on proposed new Dutch loan, three war office reports on Indian affairs, and ten communications from the secretary for foreign affairs. May 5 Receives reports on western land issues. May 8 Elects Jonathan Burrall and Benjamin Walker commissioners for settling the accounts of the five wartime departments. May 20 Authorizes fortnightly posts between Philadelphia and Pittsburgh. May 21 Receives treasury report on coinage. May 22 Orders institution of suits to collect outstanding Continental accounts. May 26 Receives treasury report on western land contracts and war department report on settler violations of Cherokee treaty rights. May 27--;29 Debates western land ordinance amendment. May 30 Debates Kentucky statehood in committee of the whole. June 2 Receives committee of the whole report recommending Kentucky statehood. June 3 Elects grand committee on Kentucky statehood. June 5 Fails to achieve quorum. June 6 Authorizes survey of New York--; Pennsylvania boundary preparatory to granting Pennsylvania greater access to Lake Erie. June 9 Directs treasury to submit 1788--;89 fiscal estimates. June 12 Receives report on land reserve for French settlers in the Illinois country. June 13 Responds to French protest against Virginia's harboring a French pirate. June 17 Receives war office report on manpower and recruitment. June 18 Receives report opposing state inspection of the mails. June 19 Debates western land ordinance amendment. June 20 Elects Joseph Martin Continental agent to the Cherokees; authorizes negotiation of western land contract with George Morgan associates. June 24 Authorizes three-month extension of Continental claims. June 25 Abolishes office of inspector of Continental troops. June 27 Debates report on Georgia--;Creek Indian affairs. July 2 Debates western land ordinance amendment; receives notification of the ratification of the Constitution by the ninth state (New Hampshire); appoints committee "for putting the said constitution into operation." July 3 Postpones action on Kentucky statehood until proceedings shall commence under the new Constitution. July 7--8 Debates western land ordinance amendment. July 9 Refers fiscal estimates to committee; adopts "supplement" to western land ordinance. July 14 Debates report on implementing the Constitution. July 15 Rejects terms of Georgia's western land cession, but accepts responsibility for southwestern frontier defense. July 17 Directs resumption of western land surveys; rejects proposed Virginia western land reserve for military bounties. July 21 Receives report on Continental Army manpower needs. July 25 Orders deployment of Continental troops to pacify Luzerne County, Pa. July 28 Debates report on implementing the Constitution; rejects motion to establish capital at Philadelphia. July 30 Rejects motion to establish capital at New York. August 1 Extends term of northern superintendent of Indian affairs. August 4 Extends term of southern superintendent of Indian affairs. August 5--;6 Debates motions on the location of the capital. August 7 Debates status of delegates from states that have not ratified the Constitution. August 12 Plans mobilization of frontier militia against western Indians. August 13 Debates report on implementing the Constitution. August 20 Adopts 1788 requisition. August 26 Debates report on implementing the Constitution; seeks Spanish cooperation for apprehending fugitive slaves fleeing to Florida. August 28 Revises George Morgan associates western land contract. August 29 Confirms land titles of French settlers in the Illinois country. September 1 Condemns settler encroachments on Cherokee lands. September 2 Debates report on implementing the Constitution. September 3 Reserves Ohio lands of Christian Delaware Indians; rejects motion to establish capital at Annapolis. September 4 Debates report on implementing the Constitution; confirms land contract giving Pennsylvania large tract bordering Lake Erie. September 8 Receives John Jay report on negotiations with Spain concerning the Mississippi question. September 13 Adopts plan for implementing the Constitution. September 16 Recommends that states ban importation of felons; directs suspension of negotiations concerning the Mississippi question.September 18--;24 Fails to achieve quorum. September 26--;29 Fails to achieve quorum. September 30 Receives report on treasury department inquiry. OCTOBER 16, 1788 Two States attended, namely Massachusetts and South Carolina and from New Hampshire Mr Nicholas Gilman, from Rhode Island Mr Peleg Arnold, from New Jersey Mr Jonathan Dayton from Pensylvania Mr William Irvine, from Maryland Mr Benjamin Contee from Virginia Mr Cyrus Griffin and from North Carolina Mr Hugh Williamson. 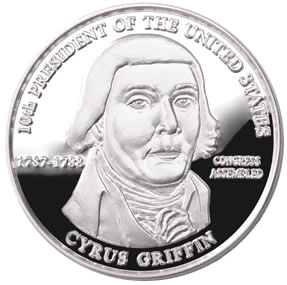 OCTOBER 21, 1788 Two states attended namely Massachusetts and South Carolina and from New hampshire Mr Nicholas Gilman from Connecticut Mr Benjamin Huntington from Pensylvania Mr William Irvine from Maryland Mr Benjamin Contee from Virginia Mr Cyrus Griffin and from North Carolina Mr Hugh Williamson. October 22-November 1, 1788 there appear attended occasionally from New hampshire Mr Nicholas Gilman, from Massachusetts Mr Samuel A Otis and Mr George Thatcher, from Rhode island Mr Peleg Arnold, from Connecticut Mr Benjamin Huntington and Mr Pierpont Edwards, from New Jersey Mr Jonathan Dayton, from Pensylvania Mr William Irvine, from Maryland Mr Benjamin Contee, from Virginia Mr Cyrus Griffin, from North Carolina Mr Hugh Williamson, and from South Carolina Mr Daniel Huger Mr John Parker and Mr Thomas Tudor Tucker. July 25, Secretary Thomson delivers papers and records of the Confederation to new federal government.